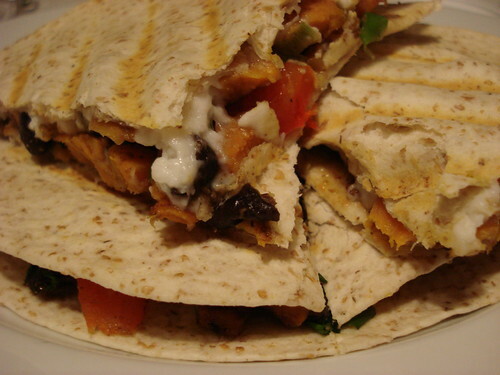 Sweet Potato Quesadillas | Mmm, Tasty! The last meal I cooked at home for us before I went on my gluten-free-almost-vegan diet was something we’d found in the Summer 2009 edition of the LCBO’s Food & Drink magazine. It actually would be easily converted into a gluten-free recipe with the use of corn or other gluten-free grain tortillas, but the way I made it was as written, with the usual flour tortillas. It makes a really delicious meal all on it’s own, although I do feel I should note that the filling has a tendency to fall out as you’re trying to eat it. Well, ok, I guess I shouldn’t say I really made it ‘as written’ – I did tweak the spices a bit. In a large skillet, heat oil over medium heat. Cook white parts of the green onion, celery, sweet potato, beans and seasonings until onions are tender and sweet potatoes are starting to brown. 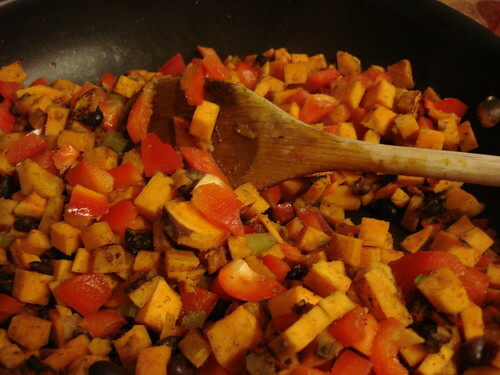 Stir in red pepper and jalapeno and cook, stirring often until sweet potatoes are tender, about 10 minutes. Remove from heat and stir in remaining green onion and cilantro (or parsley, if using). Arrange mixture on one half of a tortilla, then sprinkle with cheese of choice and fold tortilla in half to cover filling. Grill over medium heat on greased grill for 5-10 minutes, turning once, until crisp and golden brown. I used my grill/panini press to make life easier, so I recommend you go that route if you have one. Cut into wedges and serve with fresh salsa and sour cream if you like.